The Defense Department announced on Wednesday that Ibrahim al Qosi, a Guantanamo detainee who long served deceased al Qaeda master Osama bin Laden, was transferred to his home country of Sudan. On July 7, 2010, al Qosi agreed to a plea deal in a military commission that paved the way for his transfer. In exchange for agreeing to cooperate with prosecutors, al Qosi received a suspended sentence that required him to serve two more years at Guantanamo. He had been detained at Guantanamo since 2002. After al Qosi’s transfer, 168 detainees remain in DoD custody at Guantanamo. A leaked Joint Task Force Guantanamo (JTF-GTMO) threat assessment and other declassified files portray al Qosi as a devoted follower of Osama bin Laden and al Qaeda. In the JTF-GTMO threat assessment, dated Nov. 15, 2007, US intelligence analysts deemed him to be a “high” risk to the US and its allies. “Detainee is an admitted veteran jihadist with combat experience beginning in 1990 and it is assessed he would engage in hostilities against US forces, if released,” the memo reads. Because of the military commission proceedings against him, al Qosi was last interrogated in 2004. Before his interrogations were cut short, however, the JTF-GTMO file indicates that US officials were able to piece together much of his story. Al Qosi’s dossier reveals how well-traveled many al Qaeda operatives are, as he waged jihad and served bin Laden around the globe in a variety of capacities. In 1990, al Qosi met two al Qaeda members who recruited him for jihad in Afghanistan. One of the two, Jamal al Fadl, went on to become the US government’s star witness in the embassy bombings trial held in New York in 2001. Al Qosi was then trained at al Qaeda’s al Farouq training camp, which was the terror group’s primary training facility in pre-9/11 Afghanistan. In 1991, Osama bin Laden relocated to Sudan and al Qosi followed. He worked as an accountant and treasurer for bin Laden’s front companies, a role he would continue later in Pakistan and Afghanistan as well. JTF-GTMO found that after an attempt on bin Laden’s life in 1994, al Qosi was chosen to be a member of bin Laden’s elite security detail. And he was chosen to perform sensitive missions around this time, too. While in detention in 2003, the JTF-GTMO file indicates, al Qosi admitted to US authorities that he had served as an al Qaeda courier. Al Qaeda’s military commander at the time, Abu Hafs al Masri, ordered al Qosi to deliver $5,000 to an unnamed person in Addis Ababa, Ethiopia. Qosi “indicated he was unaware if the money was later used to finance” the June 25, 1995 assassination attempt on Egyptian President Hosni Mubarak. The 9/11 Commission found that the attempt on Mubarak’s life was a “tipping point” in the international community’s dealings with Sudan at the time. The would-be assassins were members of the al Qaeda-allied Gamaat Islamiyya (the Egyptian “Islamic Group”), a terrorist organization that has long cooperated with al Qaeda in terrorist attacks and other operations. They “had been sheltered in Sudan and helped by” bin Laden, the 9/11 Commission reported. The UN Security Council criticized Sudan after the country refused to hand over three members of the assassination squad. The UN then sanctioned Sudan in 1996. Even though Sudan had been connected to international terrorism prior to the attempt on Mubarak’s life, it wasn’t until after the failed hit that real pressure was mounted on the nation to expel bin Laden. Al Qaeda’s CEO returned to Afghanistan shortly thereafter. US authorities were apparently unable to determine whether the funds carried by al Qosi were used in the plot. But the timing was certainly suspicious. A source described as “credible” in the JTF-GTMO file told authorities that he had obtained a passport for al Qosi so he could travel to Ethiopia shortly before the plot against Mubarak was launched. Al Qosi continued to seek opportunities to wage jihad, according to the JTF-GTMO files. In 1995, he asked permission from bin Laden to fight in Chechnya. Bin Laden approved the request and financed al Qosi’s relocation. He then spent one year in Chechnya “as a 120 mm mortar operator” before rejoining bin Laden in Afghanistan. In December 2001, after fleeing Tora Bora, the Pakistanis captured al Qosi as he fled the Battle of Tora Bora. al Qosi was captured as part of a group dubbed the “Dirty 30” by US intelligence officials. Also in the group were other members of bin Laden’s bodyguard detail, as well as Mohammed al Qahtani, the so-called 20th hijacker. Qahtani, who was slated to take part in al Qaeda’s most devastating attack on Sept. 11, 2001, had been denied entry into the US just months before. Much of the JTF-GTMO file is based on al Qosi’s own testimony to military interrogators and FBI agents. But other al Qaeda operatives, including some who were held in the CIA’s controversial detention and interrogation program, identified al Qosi and described him to authorities as well. One of these detainees is Abu Zubaydah, a senior al Qaeda operative who is still held at Guantanamo. Zubaydah identified Qosi as “an al Qaeda member who served as a bodyguard for” bin Laden. When Zubaydah last saw bin Laden in late 2001, the al Qaeda master “was accompanied only by close associates and bodyguards,” including Qosi. The intelligence reports citing Zubaydah’s testimony are dated 2002 and 2003. Zubaydah was subjected to so-called enhanced interrogation techniques, including waterboarding, beginning in August 2002. Another senior al Qaeda detainee who identified al Qosi as one of bin Laden’s bodyguards is Ahmed Khalfan Ghailani, who helped plot the 1998 embassy bombings in Kenya and Tanzania. Ghailani was initially held by the CIA, then at Guantanamo, and subsequently transferred to New York to stand trial in 2009. Ghailani was convicted on one charge of conspiring to commit a terrorist act. Two other detained al Qaeda operatives who identified al Qosi are Mohamedou Slahi, who helped recruit al Qaeda’s Hamburg cell for 9/11, and Sharqawi Abdu Ali al Hajj (a.k.a. Riyadh the Facilitator). 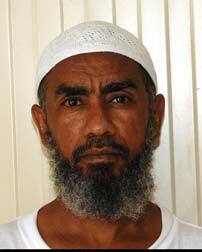 Slahi was subjected to a harsh and coercive detention regimen at Guantanamo in 2002. Both Slahi and al Hajj allegedly identified al Qosi as an al Qaeda operative. Much of the media’s coverage of al Qosi’s plea deal and transfer has focused on some of the menial tasks he performed, including as a cook and driver for bin Laden. This is in part because al Qosi pled guilty to only some of the allegations against him. The dossier put together by JTF-GTMO analysts adds more layers to his story, including al Qosi’s role as a well-trained fighter and courier. Al Qosi was so close to bin Laden that he “frequently witnessed [bin Laden] speaking publicly about upcoming attacks against the US,” the JTF-GTMO threat assessment reads. This includes “two weeks prior to 11 September 2001,” when bin Laden “sounded an alert to evacuate Kandahar and re-locate to Kabul.” Al Qosi did as ordered. Are they crazy!? Turning this character loose is fostering murder. This man is not reformable- he will kill again. Thanks, Mr. Joscelyn for this coverage. I tell my friends about LWJ but the indifference out there is palpable. This story does beg the question: why would our government release this sworn jihadist? He is obviously a commited enemy, yet he is now free again to plot and murder. This is sick. Who is looking out for U.S. interests? Seems it is not our own government. Sudan wont do the West any favours!he will be released asap. What brains in the Obama administration have recomended release of this murdering jihadist? Only thing we can hope for is he decides to take up the jihad again and a drone in the sky happens to be present. Or is that the US Gov’s wish? One can only hope so!